On June 24, Sotheby’s Impressionist & Modern Art Evening Sale realized the second highest total for any sale ever held in London – $282.1 million. Thus, the auction house decisively overtook Christie’s that had realized “just” $113 million the day before. This Sotheby’s sale was led by Gustav Klimt’s Portrait of Gertrud Loew (1902). It was sold for $38.9 million, exceeding its estimate by more than $10.5 million! Now the beautiful portrait of Gertrud Loew (Gertha Baruch von Felsőványi) will gladden the eye of one of the famous private art collectors. However, the good news is that it will be presented at the major exhibition at Neue Galerie New York next fall. 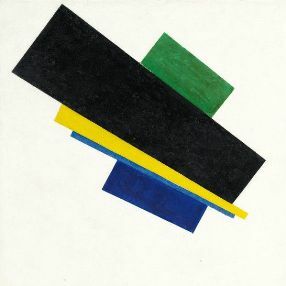 The canvas artwork by Kazimir Malevich, entitled Suprematism, 18th Construction, depicting green, black, yellow, and two shades of blue rectangles, was sold for $33.6 million, exceeding the lower-bound estimate by $2.2 million. Malevich completed this work in 1915, the year that eventually marked the beginning of the Suprematism period in his work and in the history of fine art on the whole. Another highlight of Sotheby’s Impressionist & Modern Art Evening Sale was a small painting by Edouard Manet, entitled A Bar at the Folies–Bergère (Le Bar aux Folies-Bergère), which was the first version of his famous barmaid. It was sold for $26.6 million. Finally, it is impossible not to mention Pablo Picasso’s masterpiece Two characters (Reading) (Deux Personnages (La Lecture)), which brought Sotheby’s auctioneers $25.2 million.